I really hate to make this decision, but I’m going to have to postpone releasing Revelation for another week – two at most. I committed to releasing on October 1, and tried my very best to meet that goal. I am working tirelessly in order to get it out as soon as possible. Once Revelation is ready, I will post everywhere there is to post so that people will know. I am incredibly sorry, as I’ve already told people personally/through email that the book will be out on the 1st. Expect it to be out sometime early to mid-October now. Now, the reasons. The manuscript was orginally a mere 49,000 words. After three rounds of edits, it is now 72,000 words. I have a lot of extra words that I had not been counting on, which means editing takes much, much longer. Once done with a final round of editing, the manuscript still needs to see the copy editor. Copy editing is pending upon my completion of the final version of the manuscript. As I said before, this could be a week, two at most. The positive of this is that Revelation will be released with very few typos and be a more complete package. I could release at my projected time, but I don’t feel it would be fair to you as readers to release something that wasn’t yet ready. Things come up, and I couldn’t have predicted how much the manuscript expanded. I guess that’s more story to enjoy, but all the same, I will take it as a lesson not to bite off more than I can chew, as well as give myself a little more cushion when timing my releases. As much as I’d love to release a new book every two months, the reality is, I work a full-time job that makes this very difficult. I will know better for next time. As always, thank you for your patience and continued support! You guys are the reason I write, and hopefully, you’ll all bear with me for another week. I’ve been having a lot of trouble wrapping my head around how fast things seem to be taking off. I have been stunned by the response the The Wasteland Chronicles has gotten in the past week. I really don’t want to say numbers right now, but let’s just say I’m getting more downloads a day than I got a month, at least when I first started out. It was all because of setting my first book to be permanently free, which probably increased my sales by a factor of three. Then, on the twenty first, the BookBub promotion, went out, which kickstarted my first book to visibility. Apocalypse got to, and stayed, in Amazon’s top 100 free for five days straight. It peaked at #7 on the twenty second, and hung in the Top 25 for a while after. On Apple, Apocalypse has been the number one downloaded science fiction (or at least held that spot) every day since the twenty first. It’s tapering off, now, and it’s been so much coming in that I’m starting to wonder whether this is going to last a lot longer that the one month I originally expected it to. It is absolutely amazing. I haven’t really told anyone about it except my parents and family, because I’m still afraid it’s not real. I never expected this much of a reaction. I will be at work, and then the thought will hit me: I’ve sold over 100 books today. It doesn’t seem real. It seems ridiculous. And it’s not only people downloading the books, they are leaving good reviews and even reaching out to me to let me know how much they enjoyed them. In short, it’s a dream come true. This September has been my craziest, best ever month in writing. But I wouldn’t be here today without all the support I’ve received, from friends, family, and fans. And of course, working hard through the times when I’d go days without a sale. I’m hard at work on Book 4, and it should still be out on the 1st. Needless to say, a lot more people are waiting on this release than Book 3. The pressure is on, but it’s a good pressure. It makes me want to continue improving. I’ve gotten a lot better since book 1, and I’m trying to keep it that way. So far, Revelation is 71,000 words, the longest installment so far by a long shot. I’m adding on a few more thousand words, but it’s already been edited through three times by yours truly. The majority of the weekend will be spent editing and getting rid of typos. I will have my dad helping me out with that, and maybe some other people. It’s a lot of work to do in a short amount of time. I plan on hitting publish Monday night, so it’s available in the morning. I can hardly wait. Thank you so much to everyone – to everyone who found the book for free, and everyone who took a chance on it back in the day. It means the world to me. I’ve Started a Facebook Page! This is something I’ve been thinking of doing for a while, but I have finally done it. It’s online, and can be found here. I think Facebook is the best place I can connect to readers. It’s how I connect with the authors I like, so it’s probably a safe bet that it will work the other way around. As The Wasteland Chronicles has been picking up a little more steam, it’s my hope that I can use this page to connect with my readers. Alright, I’m very excited about this cover. Amazing work once again from Luke Atkinson. Alex and friends return to a Wasteland in turmoil. The Raiders are scattered, the Exiles hunted, and the feuding Vegas gangs plot one another’s destruction. Makara, head of the New Angels, has the difficult task of convincing disparate groups to work together before Emperor Augustus and his legions arrive. But while humanity fights amongst itself, the Great Blight prepares its final onslaught – and at the center of it all, there is a secret that could spell the end of the invasion. It is a revelation only Alex can discover…and it might cost him everything. Hey guys. What’s up? It has been a while since I’ve posted. Busyness, you know. Actually, that’s not really an excuse, because I just haven’t made myself blog in a while. Ran out of things to talk about. I have a new book coming out soon, and I’m very excited about it. The cover is 99 percent done, and it looks amazing. In fact, it’s on Goodreads right now, though there will be some minor tweaks to it. I won’t post a link (mostly because I’m lazy). My next post will be of the book cover. Well, honestly, I don’t have much of a life right now. Which is a good thing, in a way. It means I have a lot of time to write. It’s ironic that I can write about life when I’m not really living one. Ironic, and sad, in a way. I guess that’s just where I am at this point. I’m determined to keep going until I make it. I want to keep getting better at this, and I see some positive growth. I’ve sold 113 books so far this month. It’s amazing to see all this hard work I’ve put in paying off, and I’m grateful to many writers for pointing me the right way, whether they knew it or not. As we got into Fall and book-buying season, I’m expecting great things. And starting to publish my books on Barnes & Noble, Apple, and Kobo was the right choice as well. I’m surprised at the amount of sales I’m getting there. I was expecting, like, two, but it’s been more than that. Last week, Apocalypse went permanently free. It’s something I’ve been contemplating for a couple of months now, and I finally got the cajones to try it. A lot of indie writers have tried it, with varying levels of success. It can be a good tool to get readers to try your writing. Since Apocalypse went permanently free last week, the first book has been downloaded over 1,500 times, in a lot of different places (yeah, I’m looking at you, India). That’s crazy. Of course, the whole idea of giving the first book away for free is that it’ll give the chance for readers to sample your writing at no risk, and if they like what they read, they can go on to the next book. And if they don’t like it, they can leave a scathing review and try to destroy your soul. Well, hopefully the soul-owning doesn’t happen. So far, I think the permafree thing is working. It’s led to more sales on my second and third books, but it’s really hard to tell until I’ve tried it for longer. I think I’m definitely making up for the lost sales, and hopefully there will be positive growth. My hope is that both books can eventually crack the top 10,000 Kindle books and stay there while the first one stays in the top 1,000 free. That would be amazing, but I don’t know if it will happen anytime soon. Origins has only crept as high as 19,000. Seems it’s harder to get higher ranked compared to the beginning of this year. There are just so…many…books now. But if either book makes it up there, well…did I already say that would be amazing? A fella can dream, I guess. The only real thing I can do is keep writing. And keep writing I shall, because I love it. I’m glad people are finding the books and reading them. It could be a lot, lot worse, so I’m grateful. Makes me wish I didn’t give up back in 2011 after publishing Necromancer. I wasted almost two years of writing time. I don’t know how much longer these Wild West days of self-publishing will last, but hopefully it will be long enough for me to make my splash. I think I just wrote the final scene for Revelation. This one was written very quickly – about one month – and it’s quite different from the first three. There’s still plenty of action, but it has a slower pace. More pieces come into play, and I hate to think of it as a set-up to the fifth book, but in a lot of ways, it is. There is no big confrontation in this one – that will probably be for Book 5, which will probably be the longest one in the series just for the sheer amount of things that have to happen. 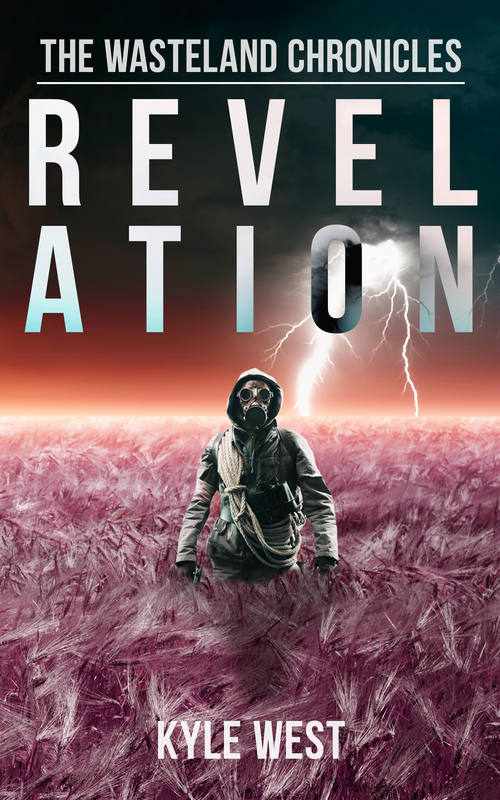 Revelation is about 51,000 words now, and as I go through with my edits, that may increase. The main plot point is a game changer for sure, and will give the series the final direction it needs to reach its conclusion, two books in the future (possibly three). Some noteworthy things about Revelation is that is the beginning of a change in pace for the series. Characters find themselves in new roles as they adapt to new situations and new threats. Alex takes on an increased role for himself toward the end. There’s a BIG TWIST toward the end where suddenly, everything will make sense about the xenovirus…and the “revelation” itself is quite mind-boggling (hopefully). In short, the characters will receive all the information they need to know to plan for the final attack on the Crater – but first, they’ll have to deal with the opposition in the next one or two books: The Black Reapers, and the Nova Roman Empire. That one will be a lot of fun to write.